BRISBANE, 7 June  – A grave report of fluorosis in humans and animals in the western areas of Queensland dependent on supplies of bore water has been presented to the Cabinet and has caused much concern. 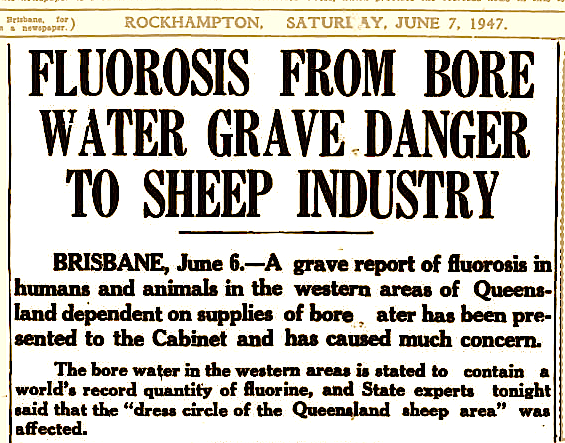 The bore water in the western areas is stated to contain a world’s record quantity of fluorine, and State experts tonight said that the “dress circle of the Queensland sheep area” was affected. The report lists serious cases of fluorosis among men, women and children. The report, which will be presented to the Cabinet in full next week, is expected to warn the Cabinet of the risk of fluorosis to Brisbane residents from vegetables, notably cabbage, grown with the aid of superphosphates, which contain fluorides. The highlights of the report are understood to be the need, for appreciating immediately that some fluorine bores have a fluorine content exceeding 20 parts in 1,000,000 far exceeding the content of the water in some provinces in China, where humans are deformed by fluorosis. The worst-affected areas are throughout the north-west and south-west, but fluorosis has also been found in the central-west. The more-recently-opened bores appear to have the highest fluorine content. Affected, water can be treated successfully for human consumption, but it would be uneconomical to treat bore supplies for stock. The only remedy appears to be the closure of bores in the worst areas and reliance on surface water traps. The presence of one part in 1,000,000 in water is beneficial to the teeth and bone structures, but the difference between a beneficial amount and a toxic amount is small. A Brisbane doctor stated tonight that excess of fluorine caused teeth to become mottled and pitted and extremely brittle. Small growths appeared on the bones and serious deformities may occasionally occurred. Approximately 2,000,000 of the State’s 16,000,000 sheep are stated to be affected with fluorosis, which halves the average life of an animal by affecting the teeth and bone structure. An official of the United Graziers’ Association said tonight that land values throughout the affected areas would fall with the issue of the report and the Government would be asked for drastic reductions in rents. A grazing official said the report made it clear that the sheep industry was faced with a serious problem. Fluorosis now stood out as the main reason why the State’s sheep population had been fairly static, with small lambings.